The Land Trust of the Treasure Valley holds a number of easements, either permanent or revocable, to ensure access or conservation value is protected. Some of these easements are detailed below. In 2018, the Land Trust secured easements on Cartwright Ridge. The trail allows connectivity between PoleCat Reserve and the Hidden Springs Community. An existing trail is 4 miles long, though it has never been maintained and is in need of several reroutes. The Land Trust will work with the private owners, volunteers, and other organizations over the next few years to bring Cartwright Ridge up to its full potential. Check out the trail map here. This 80 acre farm was protected with a conservation easement donated to the Land Trust by Evelyn Craig, daughter of V.V. Sparks. The property is on Highway 55 near Lake Lowell and a short distance from the growing edge of Nampa, Idaho. It will be a farm or wildlife habitat forever. This 160 acre jewel on the Boise River is protected with a conservation easement granted to the Land Trust by owner Ron Sali. The property and diverse habitat draws a wide variety of bird species, deer, turkey and wintering bald eagles. Next to Linder Road, the open vistas will become tremendously valued in the years ahead. Jon and Mary Trail have created a jewel of a wetland. The Land Trust serves as trustee of mitigation funds for the wetland construction that also includes reintroduction of a plant once thought to be extinct! Due to their diligence, the Indian Valley Sedge is gaining ground. The Trails are true Idaho conservationists! The Trail property contains two rare plant species on 44 acres protected by a conservation easement donated to the Land Trust. It is located north of Payette, Idaho. The Land Trust holds an easement on 59 acres of this rural subdivision which limits fencing of the lots to allow big game migration. 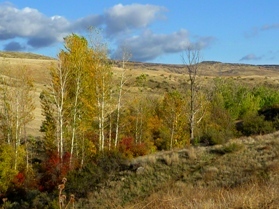 The easement also protects a section of Dry Creek, one of the longest creeks in the Boise Foothills. A real estate transfer fee from the sale of lots will establish the stewardship fund for the easement. The Hidden Springs Community contains over 900 acres of natural open space which includes wetlands, farm, Dry Creek and Currant Creek with associated habitat corridors and mid-elevation foothills areas. The Land Trust is assisting the Hidden Springs Town Association in managing these lands. The project fits nicely into the Dry Creek Watershed Initiative which focuses on assuring a healthy watershed for people and wildlife. The Harris Family has partnered with the Land Trust and others to set aside various open spaces in Harris Ranch. Alta Harris Creek is a constructed side channel of the Boise River. This trout stream will be protected forever by an easement held by the Land Trust.